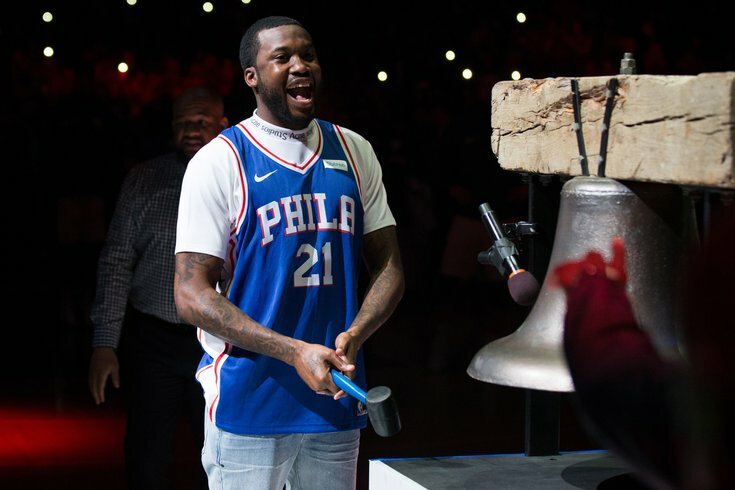 Meek Mill rings the bell before a Philadelphia 76ers playoff game on April 24, 2018. Mill's new album 'Championships' was released Thursday, Nov. 30. It is the North Philadelphia rapper's first recording since being released from prison. Meek Mill will be the opener to this year's NBA All-Star Game and will introduce the teams before rapper J. Cole headlines the halftime show. Meek is riding on the success of his latest album "Championships." And within the last week, he performed a mashup of songs from the album on "Saturday Night Live" and announced he returned to the studio to work on his next project, "Dreamchasers." The Philly rapper has a pretty rich history with the basketball. Right after he was released from prison in April 2018, he showed up at a Sixers game and rang the ceremonial pregame bell. He's also known to be close friends with Sixers co-owner Michael Rubin. J. Cole is returning to his hometown of Charlotte, North Carolina, to perform at the Spectrum Center on during the NBA All-Star Game. The Sixers' Joel Embiid will be among the starters playing in the game. This is this his second time as an all-star. The all-star reserve players – Ben Simmons potentially among them – will be announced Thursday, Jan. 31. Grammy Award winner Anthony Hamilton will perform the U.S. National Anthem and pop singer Carly Rae Jepson will perform the Canadian National Anthem. The game will air live at 8 p.m., Sunday, Feb. 17, on TNT.